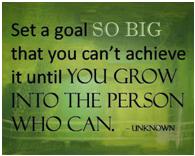 As a business leader, woman, and mother, this strikes a deep chord: it is always the goals I have no idea how to achieve when I set them, but believe in with great passion, that teach and stretch me the most. With this quote fresh in my mind, I flew out the day after our meeting to spend three days with a client also working hard to achieve a big dream they’ve been chasing for several years now. The people in this organization are excited, inspired, and a little bit daunted by the challenge they have set for themselves. I was struck as I talked with leaders across the system that I was witnessing an organization collectively growing into its dream. I’ve worked closely with these wonderful people off and on for a little over three years and they are now in the midst of a well-planned and thoughtful leadership transition. Many people I’ve known for a long time look more relaxed, more confident, and more hopeful than I’ve seen them, and a good many commented that the leadership changes would allow the seeds the organization has been planting to thrive. I saw something else at play though: a wave of outgoing leaders who had been integral to setting a bold vision, dedicated enough to inspire and develop people to believe it was possible, and brave enough to recruit a new generation of leadership excited and ready to make it real. What a tremendous legacy they are leaving: an organization ready to realize its dream.